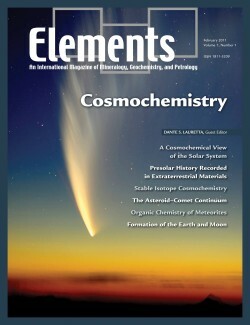 Every two months, Elements magazine will offer free access to one (or more) of our issues. To gain access to member only content, consider joining one of Elements 17 participating societies. Click here to learn how to subscribe. Cosmochemistry is the study of extraterrestrial materials aimed at understanding the nature of Solar System bodies, including the planets, their natural satellites, and small bodies. An important goal is to increase our understanding of the chemical origin of the Solar System and the processes by which its planets and small bodies have evolved to their present states. Research in cosmochemistry covers a wide range of disciplines and techniques, including mineralogy, petrology, major and trace element chemistry, isotope compositions, radiometric ages, magnetism, and radiation-exposure effects. These studies provide a wealth of data about the processes of stellar evolution, planetary system formation, alteration in asteroidal and cometary interiors, and the accretion history of the Earth, including the origin of Earth’s volatile and organic material. Of all naturally occurring clays, bentonites are arguably the most interesting, versatile and useful. 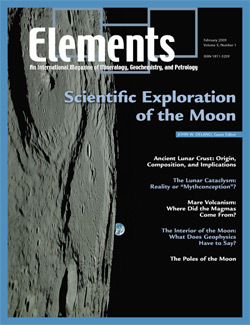 This issue of Elements describes how these fascinating materials occur and how they are used in all manner of applications. Composed predominantly of swelling minerals (smectites) and formed mainly from the alteration of volcanoclastic rocks, bentonites are used by geologists for stratigraphic correlation. Bentonite deposits are mined worldwide as they are commercially very valuable. Because of their physicochemical properties, bentonites are used in a wide variety of industrial applications, including the drilling industry, foundries, civil engineering, adsorbents, filtering, etc. Recent formulations of polymer–smectite nanocomposites have been used in industry to make new materials with amazing properties and diverse applications. Bentonites play an important role in the protection of the environment from industrial waste and pollutants and have also been used in medical applications in human health.